2018 BMW C Evolution. Picture credits - BMW. Submit more pictures. The powerful, fully-electric drive quickly brings you to your destination and in so doing ensures sheer riding pleasure. And thanks to a range of up to 160 kilometres, your joy will last all day long. Electrical: Air-cooled lithium-ion high-voltage battery with booster fan battery. Comments: 8 kWh lithium-ion battery. (3 modules, twelve 60 Ah cells per module. Range 162 km. Windscreen. Ask questions Join the 18 BMW C Evolution discussion group or the general BMW discussion group. Get a list of related motorbikes before you buy this BMW. Inspect technical data. Look at photos. Read the riders' comments at the bike's discussion group. And check out the moped's reliability, repair costs, etc. 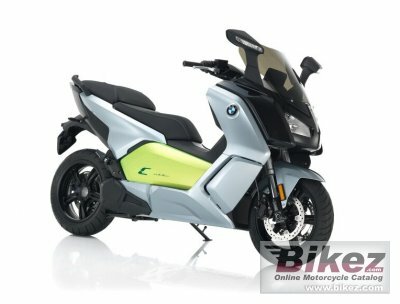 Show any 2018 BMW C Evolution for sale on our Bikez.biz Motorcycle Classifieds. You can also sign up for e-mail notification when such mopeds are advertised in the future. And advertise your old MC for sale. Our efficient ads are free. You are also welcome to read and submit motorcycle reviews.